UPDATE: Reading the fine print on the Bell contest webpage you will see it says “approximate retail value of $599.99” which would lead us to believe that the no contract price of the Galaxy S II will be $599.99!! So we’ve all been waiting, and while this may not be the news you want to hear, Ma-Bell has officially dropped the bomb telling us they will be releasing the Samsung Galaxy S II in the coming weeks (So far Rogers and Telus have announced nothing). 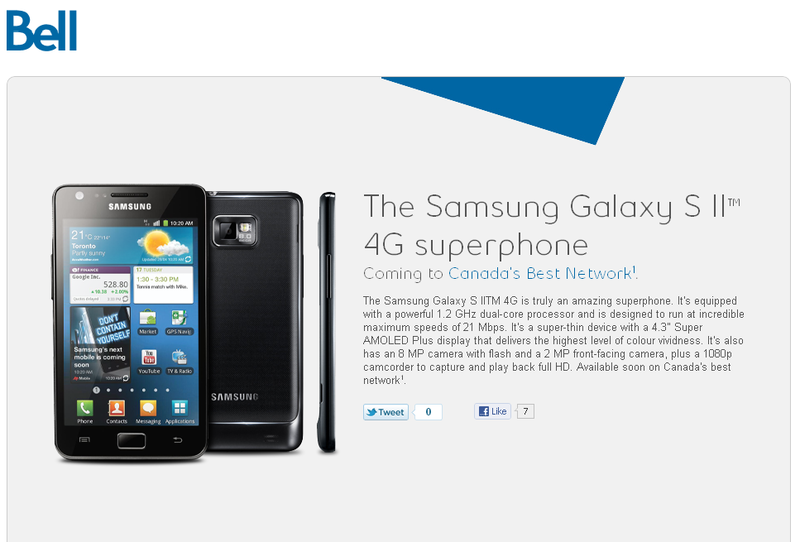 They will be calling it the Samsung Galaxy S II 4G in a move to try and promote their 4G network. To celebrate this fact, bell is holding a contest where you can enter to win one of 10 here, the draw will be done on July 19th meaning the phone must be released by then at the latest, but previous rumours point to a July 14th release date. So far there is no word on pricing but SaskTel recently announced their pricing for the Galaxy S II so check out our post here for that info. As a quick recap of the Galaxy S II’s amazing specs we have: It’s equipped with a powerful 1.2 GHz dual-core processor and is designed to run at incredible maximum speeds of 21 Mbps. It’s a super-thin device with a 4.3″ Super AMOLED Plus display that delivers the highest level of colour vividness. It’s also has an 8 MP camera with flash and a 2 MP front-facing camera, plus a 1080p camcorder to capture and play back full HD. Keep checking back for details, with a launch so soon we’re expecting word from the other big 2 any day now!